Increased fitness in tall fescue (Festuca arundinacea) is attributed to infection by Epichloë coenophiala. However, plant growth-promoting (PGP) bacteria also increase the fitness of many host plants, and PGP bacteria have been shown to dominate the phyllosphere and rhizosphere microbiome of E. coenophiala-infected (E+) tall fescue. Because E. coenophialum lives endophytically in tall fescue seeds, we hypothesized that PGP bacteria also live within the seeds and could provide fitness advantages to the host. Endophyte-infected (E+) and endophyte-free (E−) Kentucky-31 tall fescue seeds were surface sterilized to remove epiphytic bacteria. Surface sterilized and non-surface sterilized control plants of each type were cultivated for 6 weeks before withholding water to simulate drought. Normal watering was resumed after 4 days. Plant recovery of each group was measured by assigning a numerical value to tillers based on the state of decline. Surface-sterilized E+ plants were unable to recover as efficiently as E+ controls but outperformed both E− groups. Additionally, total 16S amplified DNA extracted from each seed type was analyzed with Illumina sequencing to assess the internal microbial communities from E+ and E− seeds as well as the seed coat microbiome. 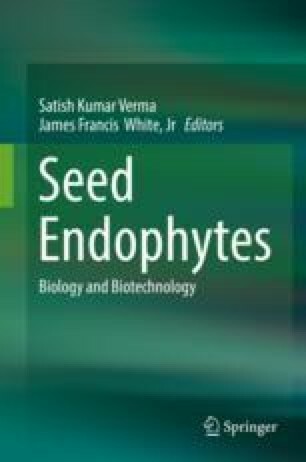 E+ seeds have lower diversity of endophytic bacterial species and are dominated by Pseudomonadaceae. Further, several of the seed endophytes are PGP bacterial strains.